We often assume that the Victorian Age was a time of unrelenting gloom, but perhaps it is that very gloom that meant that when they came to a feast such as Christmas, they rather let their hair down. The Christmas tree was popular in courts and amongst the nobility in the early 19th century. The tradition was particularly strong in Germany where, at numerous Christmas markets, glass beads and garlands, and baked items such as gingerbread men, were sold to be attached to decorate your tree. Following Queen Victoria’s marriage to her German cousin, Prince Albert, the custom became popular throughout Britain, and by 1841 was widespread. 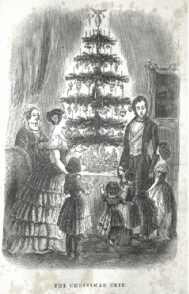 A woodcut picture of the British Royal Family around their Christmas tree, which had appeared in the Illustrated London News in 1848, was oddly responsible for spreading the popularity of the Christmas Tree in the USA. The picture was changed slightly to remove the Queen's crown and Prince Albert's moustache and published in Godey's Lady's Book as a typical American family! Note that they used real candles to light the tree in Victorian times, which may have been a bit of a fire hazard. 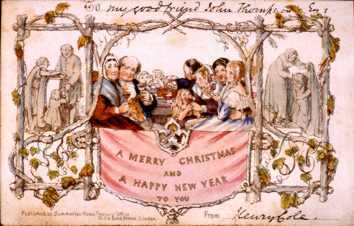 Christmas cards also originated in Victorian Times, with the first commercial cards being produced in 1843. Sales in the first year reached the dizzying heights of 2050 cards! Many people made their own cards and sending them was made easier with the popular penny post which had begun in 1840. Later in the 19th Century, established writers and artists became involved in an attempt to create cards that had beautiful pictures and appealing prose and the card became seen as a vehicle of artistic excellence. Christmas cards are now sent out in millions. 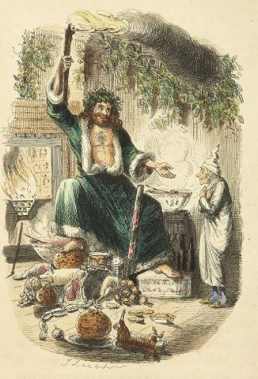 The Father Christmas known to the Victorians was the one that can be seen in Dicken's Christmas Carol. He is a great genial man in a long green fur-lined robe. He represented Christmas Present and epitomises the spirit of good cheer. This Father Christmas did not give out presents and he was not particularly associated with children. The more modern version of Santa Claus, dressed in a red suit, carrying a sack of toys, largely originated from the United States and has much taken from Dutch Tradition which was taken to the USA in the 17th century by Dutch Settlers. Sinter Klaas was based on the legend of St Nicholas. Carol Singing was a British custom that was encouraged by many "new" carols written through the Victorian period. Groups of singers and musicians travelled from house to house giving impromptu concerts. If they were lucky they were given warming drinks. Crackers were invented by Tom Smith, a London sweet maker in 1846. He had brought the bon bon, an almond flavour sweet, from Paris, but he wanted a way to promote them. His first idea was just to wrap sweets in a twist of coloured paper, but this was not successful until he added love notes (mottos), paper hats, small toys, and of course the bang. This recipe has been converted to modern measurements, but will make a good rich Christmas pudding. Exact method from the book. Skin the suet or chop it finely. Clean the fruit, stone the raisins, finely shred the mixed peel; peel and chop the lemon rind. Put all the dry ingredients in a basin and mix well Add the milk, stir in the eggs one at a time, add the rum or brandy and the strained juice of a lemon. Work the whole thoroughly for some minutes, so that the ingredients are all well blended. Put the mixture in a well greased or floured pudding cloth. Boil the plum pudding for 4 hours or steam for at least 5 hours. Sufficient for 8 or 9 persons. And finally, just in case you wonder why it was called a plum pudding when it has no plums in it, the answer is simple. Adding the liquid to the dry ingredients was known as “plumming”, a description of the fruit expanding in the liquid.